Title: 07/26/1989 - Labeling requirements of the Hazard Communication Standard. The Honorable Robert W. Kasten, Jr. This is in response to your correspondence of June 27, addressed to Ruth Knight, Director of Intra-governmental Affairs, on behalf of your constituent, Ernest E. McClellan of Plast-O-Meric, Inc., regarding the label requirements of the Occupational Safety and Health Administration's (OSHA) Hazard Communication Standard (HCS), 29 CFR 1910.1200. The HCS requires shipped containers of hazardous chemicals to be labeled, tagged or marked with the identity of the hazardous chemicals, appropriate hazard warnings, and the name and address of the chemical manufacturer, importer, or other responsible party. Plast-O-Meric, Inc. was issued a citation for not providing appropriate hazard warnings on its containers of hazardous chemicals which are shipped to downstream employers. An in-plant labeling system was used as labels for their shipped containers, which did not include appropriate health hazard information including the target organ effects. Contrary to the statements of Mr. McClellan and his counsel, the preamble to the HCS published on August 24, 1987, in the Federal Register, includes a lengthy discussion on what constitutes an appropriate hazard warning required to be included on the label. Specific information regarding health and physical hazards is required on the label to comply with the rule. The terms "health" and "physical" hazards are defined in the HCS. The definition for health hazard includes the target organs which the chemicals affect. This information must be included in any appropriate health hazard warning. In the situation where a target organ effect is not known, a general warning statement is permitted. In all other cases, the hazard warning serves as the immediate warning of the health and physical hazards of the chemical. OSHA does allow the use of standardized in-plant labeling systems for containers of hazardous chemicals which do not leave the workplace. These labels, incorporating rating systems, often contain less detailed information on the chemical hazards than is required by the rule. However, when these labels are used in conjunction with material safety data sheets (MSDSs) which provide the required detailed information and training, as required by the standard, they are permitted for in-plant containers. In-plant labeling systems are not permitted for shipped containers unless the required label information is affixed to the container. Shipped container labels may provide the" only hazard information in certain situations and there is no guarantee that downstream employees handling or using the chemicals will be able to understand the less detailed information permitted on in-plant labels. Regarding Mr. McClellan's concern about the coverage of hazardous chemicals physically bound in a material, the standard does not cover hazardous chemicals when the material is bound in such a way that employees cannot be exposed. If there is no exposure, either under normal conditions of use or in a foreseeable emergency, then the chemical is not covered by the standard, and the hazard information for the chemical would not be required on the label. However, if under normal conditions of use, an action is performed downstream on the product that could release the hazardous chemical, then the substance would be covered under the HCS and the provisions of the standard would apply. Mr. McClellan also stated that he is not receiving hazard information from his suppliers. Chemical manufacturers and importers are required to evaluate the hazards of the chemicals they produce or import and to convey the hazard information to downstream employers and distributors in the form of labels and MSDSs If the information Mr. McClellan receives from his suppliers is deficient, he should write to both the product manufacturer and supplier for corrected labels or sheets. In the event he does not receive the corrected information, Mr. McClellan should send copies of the deficient items to his nearest OSHA Area Office and request assistance in obtaining properly completed labels and MSDSs. Mr. McClellan is also concerned that all chemical manufacturers be required to comply with the HCS requirements. OSHA would like to point out that all chemical manufacturers and importers have been required to label shipped containers of hazardous chemicals with the appropriate hazard information since November 25, 1985. We hope this information is helpful to you in responding to your constituent's concerns. Please feel free to contact us again if further assistance is needed. What is a small - scale, short - duration operation? OSHA Instruction CPL 2-2.40 is not clear in this area. It gives four (4) different definitions: Maintenance or renovation tasks where the removal of asbestos is not the primary goal of the job, activities where exposure can be kept below the action level such as glove bags, an operation included in the employer's asbestos maintenance program and non-repetitive operations. Does this mean that an employer is exempt from negative - pressure enclosure requirements on any job if glove - bagging methods are used for removal? Or does it depend on the amount of asbestos being removed? If so, what amount? Fifty lineal feet or fifty square feet is the cut-off established by the Ohio Department of Health. When is a negative - pressure enclosure required? CPL 2-2.40 says a negative - pressure enclosure is required for all removal, demolition and renovation operations (except where not feasible). In a letter to Bernard Paul of the Indianapolis Air Pollution Control Division, Tom Shepich states that negative pressure enclosures are required for all removal, demolition and renovation operations regardless of exposure levels. In a letter to Robert Bettacchi of WR. Grace and Company, John Pendergrass states that regulated areas are established only where asbestos concentrations exceed the PEL. The standard says that regulated areas shall be established whenever asbestos concentrations exceed or can reasonably be expected to exceed the standard, and that negative - pressure enclosures are required for all removal, demolition and renovation operations. Can you please provide some guidance in this area? What standard should be cited to require employees to wear protective clothing during asbestos removal, demolition and renovation operation in cases where there are no air monitoring results showing exposure above the PEL? We have been citing 1926.58(i)(3) because 1926.58(i)(1) says that clothing must be provided only for exposure above the PEL. There is no requirement anywhere in the standard requiring protective clothing inside the negative-pressure enclosure, except where air levels are above the PEL. The preamble states that protective clothing is required for all employees working in the abatement enclosure by paragraph (i)(4) (page 22706), however (i)(4) does not state that it must be provided, but rather that it should be periodically inspected and must be repaired or replaced if damaged. Supplied air respirator systems like this one from Safety Emporium are critically important when working with asbestos. Please find enclosed correspondence I received from Ernest McClellan. Because of my desire to be responsive to the constituents in my state, I am referring this matter to you for your review. I would like to request your assistance in evaluating the information provided. I would greatly appreciate your forwarding your findings in duplicate form to David Edwards, on my staff, at your earliest convenience. Again, many thanks for your time and attention to this matter. Senator Robert W. Kasten, Jr.
Our company faces a situation that could do it irreparable harm. As a result of an employee complaint, an OSHA inspection was made at our Ohio plant. We were not cited for the complaint, but were cited for improper labeling on the containers that we ship to customers. Reference to this citation is issuance date 2-21-89, inspection number 103058236, responding ID 0524700, CSHO [Compliance Safety and Health Officer] ID C5828, optional report number 264, Toledo, Ohio office. The hazard Communication Standard, 29 CFR 1910.1200 mandates use of a warning label on containers (29 CFR 1910.1200(f)(1) (2) (3) along with other information. See Exhibit 1. In OSHA Instruction CPL 2-2.38A, May 16, 1986 (a bulletin furnished to OSHA Inspectors), an interpretation of the labeling requirements is made. See Exhibit 2. The hazard warning that we will put on our drums will make it appear that our material, even though it may be the same as any of our one hundred or so competitors, is much more dangerous to work with. Phone calls and inspections of labels on competitors' drums lead us to believe that none know of the OSHA determination. This situation will exist for perhaps years. 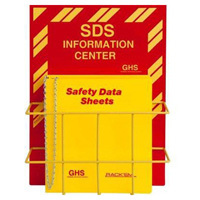 OSHA inspectors have visited many of our customers through the past few years and, while at or after visiting, have quite often called us for clarification of our Material Safety Data Sheets of the Hazard Warning Labels that we presently use. None ever said that our labeling was deficient. We retained Quarles & Brady to investigate and they were initially surprised to hear of the OSHA interpretation. They report to us that very few companies (perhaps a hundred to a few hundred) have been cited or asked to comply. Since we were cited, we must comply by May 24, 1989. See Exhibit 3. We are having problems obtaining the information required for labeling because many of our suppliers are apparently unaware of the OSHA interpretation and don't have the required information on the containers that we receive or on the Material Safety Data Sheets that they supply. We are being forced to make expenditures in time, money, and resources that most of our competitors will not. We have retained Amaitis and Associates to write a special program that will interface our computer, and that will select the hazardous ingredients in over 4,000 compounds that we supply, calculate the level, and print the necessary information. We do not wish to understate or overstate the degree of hazard and will have to retain legal counsel for a complete review. Our product liability exposure will increase because many ingredients that cannot be a health hazard after they have been added to our product must be listed. For Example, some chromium compounds are suspected carcinogens when the dust is breathed and may affect the respiratory system or stomach. We purchase chromium compounds in a liquid dispersion that cannot dust and add them to our product which is in a form that doubly assures that it cannot dust. Yet, we have to label our containers showing our product contains chromium compounds. We will be very vulnerable should an employee of a customer contract lung or stomach cancers. OSHA's approach to their interpretation of labeling requirements is akin to having a 20 MPH unposted speed limit between two 65 MPH signs, and then relying upon traffic officers to inform offenders. Why not amend 29 CFR 1910.1200, publish it, and then set a date for enforcement? We hope that there is some way that you can help us out of this dilemma. We would gladly comply if we knew that all must comply at the same time. Otherwise, as of May 24, 1989, many of Plast-O-Meric's customers will look upon us as the irresponsible supplier of toxic materials. If, at a later date, the OSHA interpretation is challenged and rescinded, we'll look even worse. Exhibit 1 - 29 CFR 1910.1200(f)(1)(ii) - Appropriate hazard warnings; and (iii) - Name and address of the chemical manufacturer, importer, or other responsible party. Exhibit 2 - OSHA Instruction CPL 2-2.38A CH-1, Jul 18,1986 (f)(1) (in part) - Consequently for shipped containers the "hazard warning" must convey the hazard of the chemical. This is intended to be specific information regarding the hazard. The specific hazards indicated in the standard's definitions for "physical" and "health" hazards would be appropriate. Phrases such as "caution", "danger", or "harmful if inhaled", are not adequate warnings for shipped containers since the availability of MSDS and the standards training requirements only apply to a limited number of establishments that will be receiving hazardous chemicals. 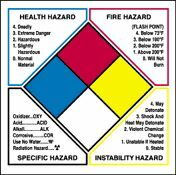 The definition of "hazard warning" states that the warning must convey the hazard of the chemical. If, when inhaled, the chemical causes lung damage, then that is the appropriate warning. Lung damage is the hazard, not inhalation. There are some situations where the specific target organ effect is not known. Where this is the case, the more general warning statement would be permitted. For example, if the only information available is an LC50 test result, "harmful if inhaled" may be appropriate. As we discussed last week, OSHA requires manufacturers of hazardous substances to list the hazards of the chemical, including the target organ effects, on the container label. OSHA has specifically stated that phrases such as "caution", "danger", or "harmful if inhaled" are not sufficient. For example, if a chemical causes lung damage if inhaled, then the appropriate warning should be that the chemical causes lung damage if inhaled. A warning of "harmful if inhaled" will not be enough. OSHA's requirement that manufacturers specifically state the target organ effects on labels of hazardous substances is nowhere to be found in the formal OSHA regulations. OSHA claims that this rule is a logical interpretation of its formal labeling regulations. Some reasonable people disagree. As you know, OSHA is enforcing this interpretation and it has cited seversl companies for violating this standard. On at least four occasions, cited companies have challenged the labeling requirement alleging that it is invalid because the proper rulemaking procedures were not followed. Unfortunately, each of those citations was settled with OSHA before the issue of the validity of the regulations was decided. As it stands now, OSHA requires the labels to state the hazards of the chemical, including target organ effects. I would imagine that this regulation will be challenged again and I will keep you informed of any favorable developments. Safety Emporium has OSHA-compliant target organ labels and much more!